The D'Oyly Carte Company began its association with Decca after World War II, embarking on a series of recordings in the late 1940s and early 50s of the major Savoy Operas. 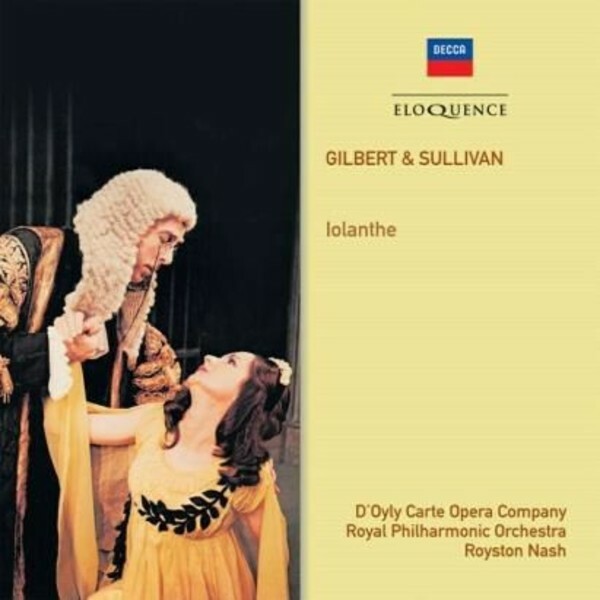 A subsequent stereo-era cycle, begun in 1957, was followed in turn by a new series of which the present 1974 recording of Iolanthe is part. In many respects, it is superior to its 1960 predecessor. Whereas the former set had used an ad-hoc orchestra, one of the glories of this remake is the contribution of the Royal Philharmonic Orchestra - immediately apparent from the atmospheric strings at the start of the overture (one of the few which Sullivan composed himself) and the brilliant woodwind playing in its fleet-footed dancing passages. Even though the RPO is far larger than the pit bands Sullivan composed for and conducted, it is a rare treat to hear one of his richest scores rendered so sumptuously under the assured baton of Royston Nash (company Music Director from 1971 to 1979). Lead comedian John Reed's reprisal of the Lord Chancellor is a more confident performance than on the 1960 set. He is supported by a generally excellent cast. The lovers Phyllis and Strephon benefit from the fine voices and lively personalities of Pamela Field and Michael Raynor. Field's silvery soprano, in particular, is a great asset. Lyndsie Holland, who presided over the 'old dame' contralto roles from 1971 to 1977, is a commanding Fairy Queen, outwardly stern but with an irrepressibly warm heart. Judi Merri's title role portrayal is ideally elfin, and her emotional involvement is affecting. A prodigy of Dame Eva Turner, Merri has an impressively full mezzo voice, although it can sometimes come across as a little overpowering on this recording. Stentorian bass-baritone John Ayldon oozes superciliousness as the unctuous Lord Mountararat, and Kenneth Sandford - John Reed's only rival for company longevity and much-loved status - makes the most of his cameo as Private Willis.